In this post we are going to cover most popular YouTube video downloaders for Mac OSX. As we watch more and more content on internet, YouTube appears to be the best channel for video. Do you know that you can download YouTube videos and watch them offline? Sure you can, and its not complicated at all if you use the right software. After searching around we present you best YouTube video downloaders we found for your Mac’s. Download videos from YouTube and other video sharing websites, like Google Video, in batch. Download HTML5 videos from YouTube, FaceBook, Vimeo and Dailymotion easily. Convert HD & standard videos to all kinds of video formats and fit them on popular devices, like iPad, iPhone, and apps, say iMovie, iDVD, etc. Tooble Free allows everyone to download videos from YouTube. It is available for anyone to use on both Mac and Windows computers. Tooble contains no spam, spyware, or adware of any kind. YouTube Downloader is a free powerful software utility that will help you to download and manage your favorite video files from YouTube. To use the application, simply enter a YouTube video web page URL into the “YouTube URL” text entry field and a preview of the video will be displayed. To download the video’s flash file to hard disk, press the “Download FLV” button. To convert the video’s flash file to a different format, adjust the conversion settings as desired and press the “Convert FLV” button. MovieSherlock is the fastest and easiest way to download and convert YouTube movies. Even this is not full list of MovieSherlock features. MovieSherlock searches and selects the most relevant movies from YouTube according to your request. Download YouTube news clips with MovieSherlock. Stay cool and up to date. Download the latest, the most interesting and the most valuable news episodes published with YouTube. Downloaded YouTube clips will be converted to be compatible with your Mac computer. Tubulator is a YouTube browser and video download tool. In addition to offer downloads of YouTube video and audio/music, Tubulator lets you browse YouTube in a way similar to the YouTube website. Search for keywords, and Tubulator gives you the search results. Browse related videos and user channel uploads/favorites – all available via a user interface not much different from your normal web browser. Search, browse,bookmark and download away! This downloader supports following types of files: FLV, SWF, XAP (Silverlight), RM and RV (Real), AVI, MOV, MP4, WMV. It has built in web browser to find videos, allows for preview of external resources used by SWF file types and other features. 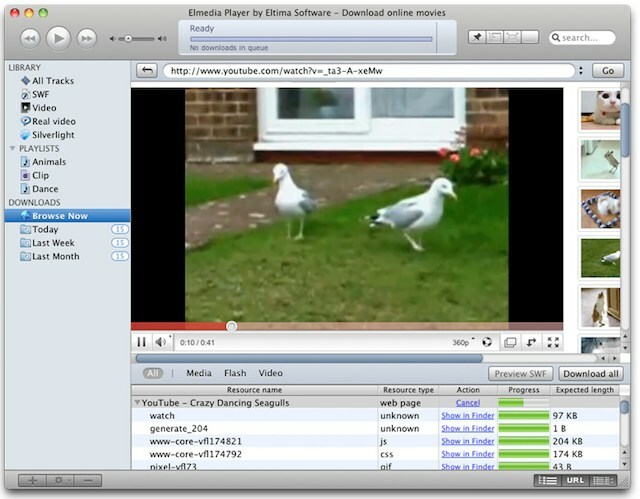 Elmedia Player PRO supports downloading streaming RTMP videos on Mac.